Just like you, I am a big fan of Living Etc. magazine and love the website. I was e-flipping through their online magazine and spotted a home feature on J. Crew Creative Director, Jenna Lyons. 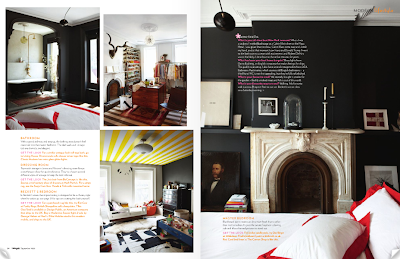 I love many things about her space (striped ceiling - yes, please) but the black walls really jumped out to me. Small space dwellers can enjoy this theme by incorporating bright accents against the dark foundation. But leave that ceiling bright white - the dark walls will draw your eye up and open up the space. 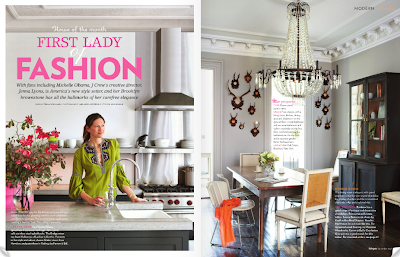 I loved Jenna Lyons' home as well. It was so personal from start to finish. I especially enjoyed the bathtub in their Bedroom. The high ceilings and the decorative coving is just wonderful in Jenna Lyons home. oh i love those black walls. so chic.